A quick post to remind you that I will be running a Diamond Jubilee blog event all next week, leading up to the long bank holiday weekend! 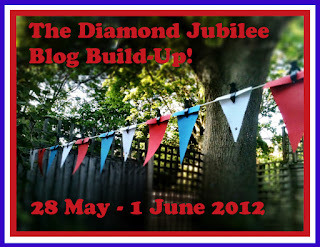 Starting tomorrow there will be five daily posts with some great jubilee-inspired ideas, crafts and recipes, plus two fantastic guest bloggers. Please stop by each day next week to get some inspiration, and meet my very special guests: Stacie Swift and Amy from No More Disco. I can't wait to show you what we've all been up to, all in the name of the Queen's Diamond Jubilee!